The 2015 provincial and eastern region winner is Martha Brown of West Lochaber Lake in Antigonish County. Martha, a retired teacher, is a living example of sustainable land management, and a continuing piece of her family legacy that has allowed her 400 acres (162 hectares) to flourish. “If I would have inherited a beauty salon, it wouldn’t have been of much interest to me, especially compared to my woodlot. 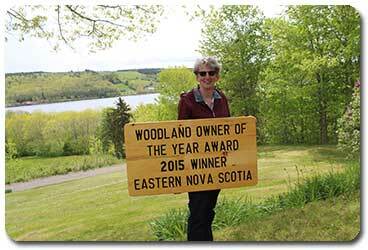 This is a family legacy that I really enjoy.” – Martha Brown Martha stresses the importance of talking and working with other woodland owners and forestry professionals. Over the years, Scott and Stewart Forestry Consultants and other land management service providers have worked with her in various capacities. Martha also utilizes her woodland for Non-Timber Forest Products; her 10 acres of naturally grown blueberries certainly sweetens up the Eastern Region. She has not used herbicide since 2006 stating “ I prefer not to spray any more than I have to”. With a keen interest in learning about woodlands and forest management, Martha Brown has a wealth of knowledge to share about her experiences and hopes her woodland can serve as an example for others. Come get a taste of what managing your woodland is like by visiting Martha’s woodlot on open public field day on October 3rd! Directions: From exit 32 of the TCH 104, head south on the #7 Hwy for approximately 19.5 km. Then turn right to West Lochaber for 400m and then turn left for 4.4 km to the parking area for the field day. Despite owning an 800 acre (324 hectare) woodlot in Windsor Nova Scotia, Mike Oulton knows his lot well enough to know individual trees. The Oultons have thinned some patches of forest two or three times in the last 40 years. To minimize damage and facilitate the harvesting process in rough areas, they wait until winter when there is snow on the forest floor. As a safety precaution the woodlot also has five fire ponds. As Mike and his son Victor showed us the enormous Hemlock trees on their property, wide smiles ran over their face. Mike spoke about how the ancient management plan called for harvesting the Hemlocks but he knew he would never cut them down. 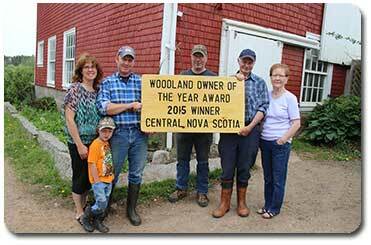 The Oulton family also have a farm roughly the same size as their woodlot. It started as a single farm bought by Mike’s grandfather in 1912. Mike has a licence to operate a zoo which is home to Yak, Wild Boar, Peacocks, hundreds of deer and more. He says “farming is always supposed to be fun!” Mike also has a meat shop that employed 14 workers. Come explore and enjoy the woods on the Martock hills this September 19th 2015! Directions: From Halifax area, take highway 101 to exit 5, turn off at exit 5, turn left onto highway #14 then drive 1 km, turn left onto Highway #1 then drive 650 meters, turn right onto Three Mile Plains Cross Road then drive 850 meters, turn right onto Windsor Back Road then continue about 2 kms to woodlot road. From Valley area, take highway 101 to exit 5, turn off at exit 5, turn right onto highway #14 then drive 1 km, turn left onto Highway #1 then drive 650 meters, turn right onto Three Mile Plains Cross Road then drive 850 meters, turn right onto Windsor Back Road then continue about 2 kms to woodlot road. From Chester area, take highway 103 to exit 8, turn toward Windsor onto highway #14 then drive approx 45 kms to Windsor Back Road, turn right onto Windsor Back Road then continue about 2 kms to woodlot road. The Melansons allow their 525 acre (212 hectare) woodlot ample time to regenerate after a cut because they are always thinking long term. They use the appropriate machinery, employ skilled and experienced workers, and practice pre-commercial thinning and partial-cut methods which results in great natural regeneration. As Gary said “Back then if you wanted to harvest wood, you would just do it and cut whatever you pleased. 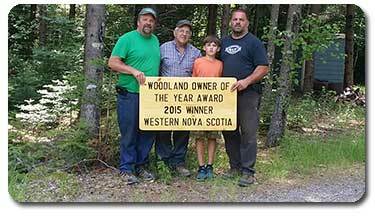 Now it is all about the long term plan.” Their woodlot in Concession, Digby County holds over a 100 years of family history, so they want to pass along a sustainable, well-managed forest to their kids. The Melanson family operates a business that supplies wood to Freeman and Sons Lumber Ltd. as well as to other buyers. Come explore the Melansons’ woodlot on Saturday September 12th 2015 to learn about their excellent woodlot management practices. Directions: If you are coming from the Valley take exit #29 on highway 101. Turn left onto Little Brook Road. At the stop sign, turn right onto Second Division Road. Melanson trucking is on your left at 2776 Second Division Road approximately 3 km. If you are coming from the Yarmouth/South Shore take exit #29 on highway 101. Turn right onto Little Brook Road. At the stop sign turn right onto Second Division Road. Melanson trucking is on your left at 2776 Second Division Road approximately 3 km.